The Maquila Solidarity Network, together with our international allies including the Clean Clothes Campaign (CCC), the International Labour Rights Forum (ILRF), Workers Rights Consortium and the International Textile, Garment and Leather Workers' Federation (ITGLWF now IndustriALL) have regularly called attention to the need for structural measures to end the consistent and ongoing worker rights violations in the Bangladeshi garment industry. Together with unions and NGOs in Bangladesh, we called upon brands and retailers, the Bangladeshi government, factory owners and their associations to take immediate action to eliminate worker rights violations and and fire and safety hazards. In Canada, we urged all Canadian retailers sourcing clothes from Bangladesh to work together with US and European retailers and brands, Bangladeshi manufacturers and their industry associations, the Bangladeshi government, and local and international trade union and nongovernmental organizations to tackle the root causes of continuing worker rights violations in the industry. 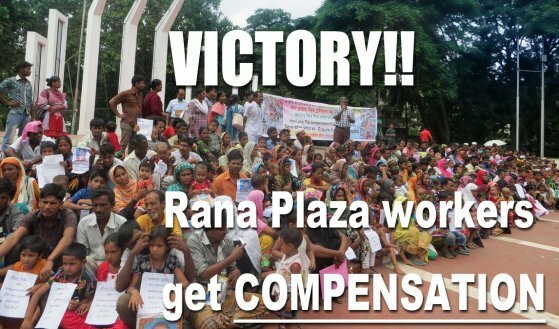 On November 24, the second anniversary of the Tazreen factory fire in Bangladesh, the Clean Clothes Campaign (CCC) and the Global Union IndustriALL announced that they had reached agreement with the European retailer C&A on a system for delivering long-term compensation to the families of the 120 workers killed and the 300 workers seriously injured. Signatories to the joint statement include 22 Canadian organizations, 30 Bangladeshi groups, the Global Unions IndustriALL and UNI, and organizations from across Asia, Europe and in the United States. To date, only seven companies, including Canada’s Loblaw, have publicly committed financial contributions to the Rana Plaza Donors Trust Fund.